There’s no doubt in my mind that breakfast is important. Not only are breakfast meals delicious, but they’re also a healthy way to kick your metabolism into gear, help balance your blood sugar, and start the day off right! I love breakfast in any form it takes, smoothies, egg dishes, coffee cake, granola… But there’s an extra-special place in my breakfast-loving heart for muffins. 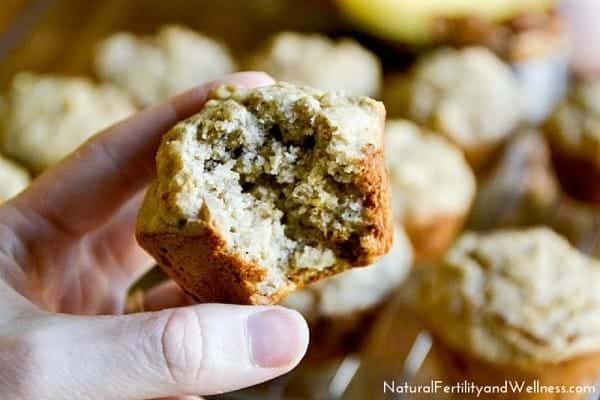 These little Banana Nut Muffins are packed with vitamins and nutrients from… you guessed, bananas and nuts. 🙂 Though most banana nut muffins I’ve had usually come with walnuts, I’ve added another of my favorites: pecans. 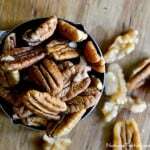 Nuts, in general, are wonderful for you, and pecans are no exception! They’re rich in copper, potassium, calcium, iron, selenium, and magnesium, an anti-inflammatory and antioxidant trace mineral. They are also an excellent source of vitamin-E, several important B-complex groups of vitamins such as riboflavin, niacin, thiamin, pantothenic acid, vitamin B-6, and folates. You can probably tell what walnuts are good for by looking at their shape. Look familiar? A little like a brain, maybe? Walnuts boast the neuroprotective compounds vitamin E, folate, melatonin, and omega-3 fats. They’re also a good source of antioxidants and their anti-inflammatory properties are known to lower the risk of chronic oxidative stress. While they’re known to be a good source of fiber, potassium, vitamin C and B6, like nuts, bananas are also full of magnesium. 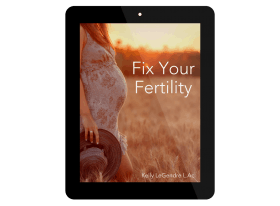 They also contain pectin, which helps detox your body from heavy metals and stimulate the growth of gut-friendly bacteria via their prebiotic content. As if all those healthy vitamins and minerals aren’t reason enough to go make yourself some of these muffins, they just happen to be pretty tasty, too. 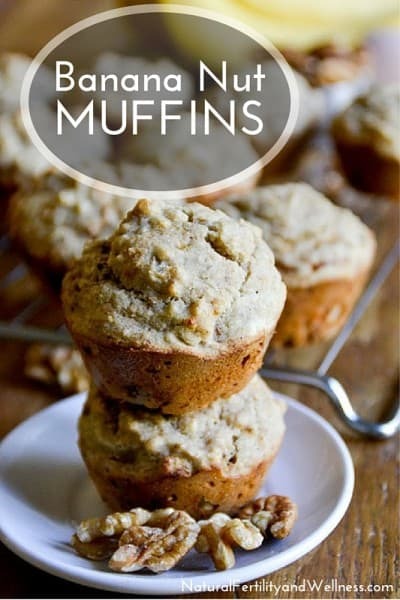 These muffins make the perfect quick breakfast or snack. Preheat oven to 350 and lightly grease a muffin tin, or line with paper liners. In large bowl, mash bananas. Stir in applesauce, eggs, honey, and vanilla. On top of banana mixture, sprinkle flours, starch, salt, and nutmeg. Stir in to combine. Sprinkle with baking powder and quickly mix in. Scoop 1/3 cupfuls of batter into prepared muffin tin and bake for 20 minutes, or until tops spring back when lightly touched. These look great! Definitely going to try them out next time I have extra bananas. 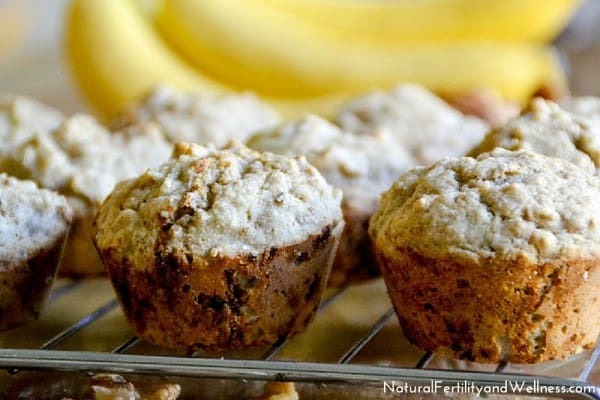 These banana nut muffins sound dreamy! The look so scrumptious too! Love how you created a yummy treat with so much good-for-ya nutrition packed inside. 😉 Thank you, Andrea! I love sneaking in as much nutrition in as possible! You can try, cornstarch, potato starch, or arrowroot powder. I love that you use honey and applesauce in this to sweeten it up! 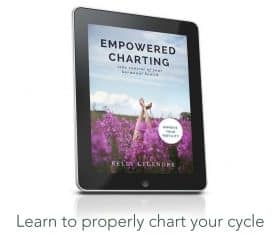 Thanks, Chrystal! I’m quite fond of applesauce in baked goods. 😉 I love the texture and sweetness it provides! It’s a great oil replacer, too. These sound delicious! I love muffins to go with my breakfast and as afternoon snacks too. The recipe looks great Raia! I love easy grab-n-go breakfasts like this! I miss walnuts, banana+walnuts is really THE best combo…and don’t even get me started on pecans, too! Dreaming of these. Nothing better than the classic banana nut! 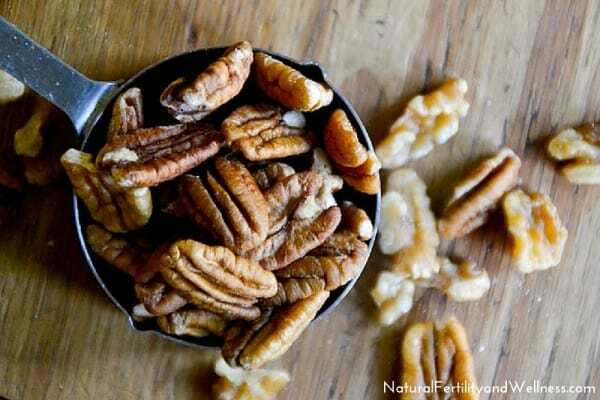 Do you have any nut substitutions for the walnuts and pecans? My daughter is allergic to both walnuts and pecans. Are there other nuts with a similar nutritional profile? Maybe not with the same nutritional profile, but I’m sure any other nut that she isn’t allergic to would work!